Becoming the latest players in the health care space to consolidate, Biogen Inc. (BIIB) announced on Monday morning it is buying London-based gene therapy company Nightstar Therapeutics PLC (NITE) for $800 million. According to the terms of the all-cash deal, the Cambridge, Massachusetts-based biotech company will pay $25.50 per share of Nightstar, which represents a 68% premium to its closing price of $15.16 on Friday. Warning! GuruFocus has detected 5 Warning Sign with TSX:ATD.B. Click here to check it out. Biogen CEO Michel Vounatsos said the acquisition of Nightstar will help it push into the ophthalmology space. "With this proposed acquisition, we are continuing to bolster our pipeline and further execute on our strategy to develop and expand a multi-franchise neuroscience pipeline across complementary modalities," he said. "Nightstar would accelerate our entry into ophthalmology by contributing two mid- to late-stage gene therapy assets, with the potential to create long-term shareholder value." In the emerging gene therapy field, which uses engineered viruses to deliver genetic material to defective cells in the hopes of improving or curing a condition, Nightstar focuses on adeno-associated virus treatments for inherited retinal disorders. Its lead drug, NSR-REP1, treats choroideremia, a rare eye disease typically found in males that leads to blindness. Another therapy currently undergoing trials is NSR-RPGR, which treats X-linked retinitis pigmentosa. Other drugs in Nightstar's preclinical pipeline include treatments for Stargardt disease, Best vitelliform macular dystrophy and other genetic forms of retinitis pigmentosa. The deal, which will be funded using available cash, is expected to be completed by mid-year 2019. Following the announcement, shares of Biogen were down 1.66% at $328.55, while shares of Nightstar soared 66% to $25.18. 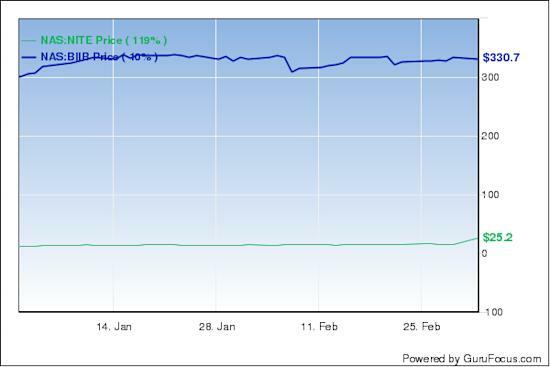 Year to date, GuruFocus estimates Biogen's stock has risen 10% and Nightstar's stock has climbed 119%.